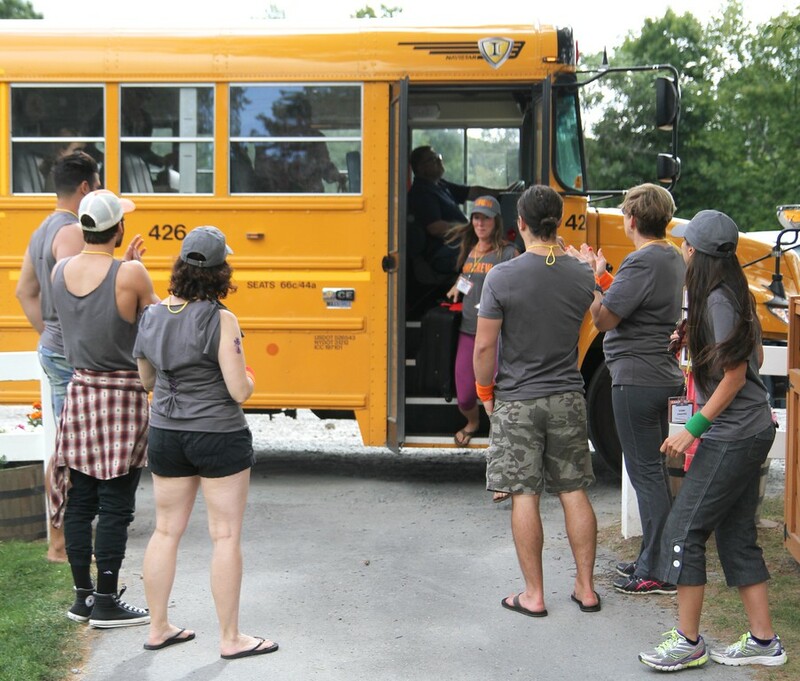 I recently returned from a summer camp for adults–for entrepreneurs, to be exact. If you’re anything like me, you want to believe summer-camp nervousness is limited to the kiddos in our lives. Adults, on the other hand, are evolved enough not to experience such trifles. Sigh. I really want to tell you my newest camp adventure came without any nerves, that my grown-up poise shone through at every moment. Darn it all, though, I never have been good at telling lies. Entrepreneurial campers arriving, in a school bus and all. Photo by Gregory Berg, Enso Photography. Here’s what actually happened. For weeks beforehand, palpable unease overtook my body. Two afternoons prior to camp, my hesitation grew so strong I contemplated skipping the whole thing and staying home. It wasn’t that I was concerned about meeting new people, though the weekend would be nearly 2,000 miles from home and I didn’t know a soul. No, what worried me was this: I’m not an entrepreneur. This is Jane. We met while making bookmarks together at the crafts table. After camp, she and I became accontabilibuddies. Every two weeks, we call each other to discuss three-month goals we’ve set for ourselves professionally and personally. Photo by Gregory Berg, Enso Photography. For 20 years I’ve worked as an educator, mostly in the nonprofit sector, at jobs that galvanize employees but tend to bleed them dry. As it happened I’d been dreaming about entrepreneurship for the better part of a year. Deeply in awe of people who build their own opportunities, I secretly wanted to join their ranks. My entrepreneurial dreams started to sink in about a year ago. I didn’t know what I expected this to mean (spoiler alert, I still don’t), but I sensed some internal shifts. My creative side starting acting braver, weirdly, almost without my knowledge or permission. Something inside had grown tired of feeling invisible and decided it needed more light. As a (lucky) member of the camp crew, my days were full of activity. 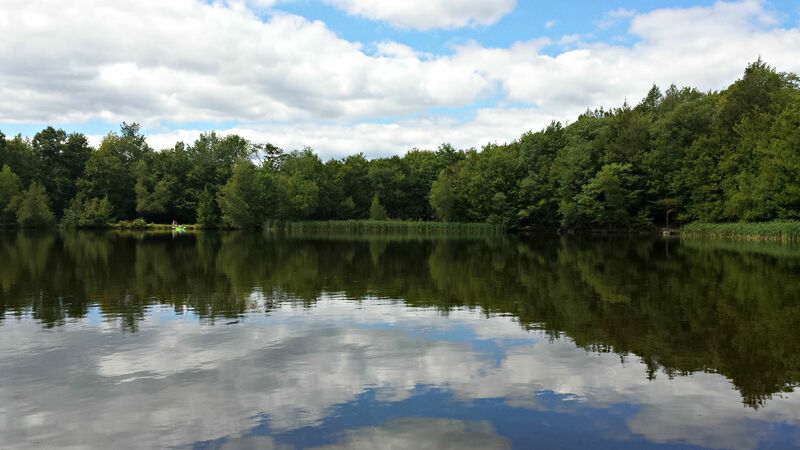 I recharged with quick walks to the lake. Unless otherwise credited, all photos in this post were taken by me. Last fall, a girlfriend and I started a journaling project. For the next 52 weeks, we’d follow prompts in Cheryl Richardson’s Life Makeovers. The book promised “practical and inspiring ways to improve your life one week at a time,” and we figured our lives were good candidates for some renovation. My response to our Week 2 prompt: Choose the quality you most want to cultivate, then write a positive statement that affirms it. Must use present tense. And so, I began. 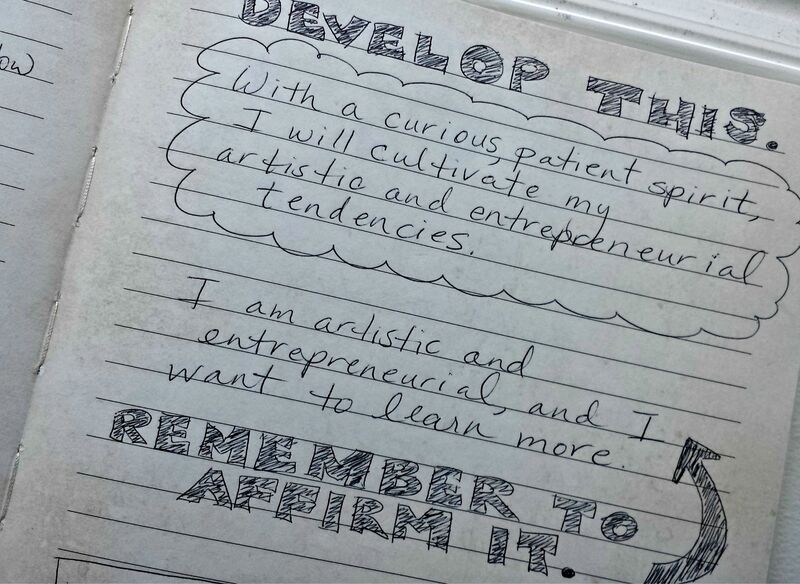 I started calling myself an artistic, entrepreneurial spirit. At least in my journal, my head, and weekly talks with my girlfriend. A few months later I started this blog. This act alone emboldened my creative confidence, immediately and with force. My first day as a Camp GLP crew member. Did I really look this angry, Gregory? Photo by Gregory Berg, Enso Photography. I enjoyed expressing my voice, unencumbered by the hierarchy that sometimes dogs my day-to-day. Unexpectedly, I found joy in community of bloggers I discovered. What a gutsy group they turned out to be! Fast forward half a year. One summer night I found myself awake and grumpy in the middle of the night. To combat my negativity, I chose to fill my mind with something better. Browsing one of my favorite podcasts, Jonathan Fields’ Good Life Project, I spotted the promo for Camp GLP. I noticed the call for volunteers and filled out the application, right then and there. Before I knew it, I found myself at camp in New York, surrounded by 370 kind, innovative souls known as fellow campers and crew. Over the next 4 days, I received the kick-start I’d been seeking. I attended workshops on things like finishing projects and understanding revenue models. All of them energized me and sparked new ideas. Arts and crafts projects–LOVE THESE–were a key part of my camp experience. When I got the chance I enjoyed solo moments, on a patch of grass under a sunny sky. Most importantly, though, I met people who inspired me. People who make podcasts and write ebooks and travel the world and create documentaries and make a living through art. They believe it all can be done, not only in ways that serve communities with compassion, but also that energize the creators themselves. Now that I’m home, I’ve discovered a whole new set of nerves. These particular butterflies flit in a new pattern, carrying uncertainties on their tiny backs. “What does being an entrepreneur really mean,” they want to know. “What makes you think you’ve got the energy to start something new?” Oh, how I wish I could jump on their collective wings and take flight! For now, though, I’m content with my role. My current job is to befriend them first, or at least get used to their presence. I want to let them take their time, while I take mine as well. As the journey unfolds, I’ll figure out where we’ll be traveling together months, a year, whenever from now. 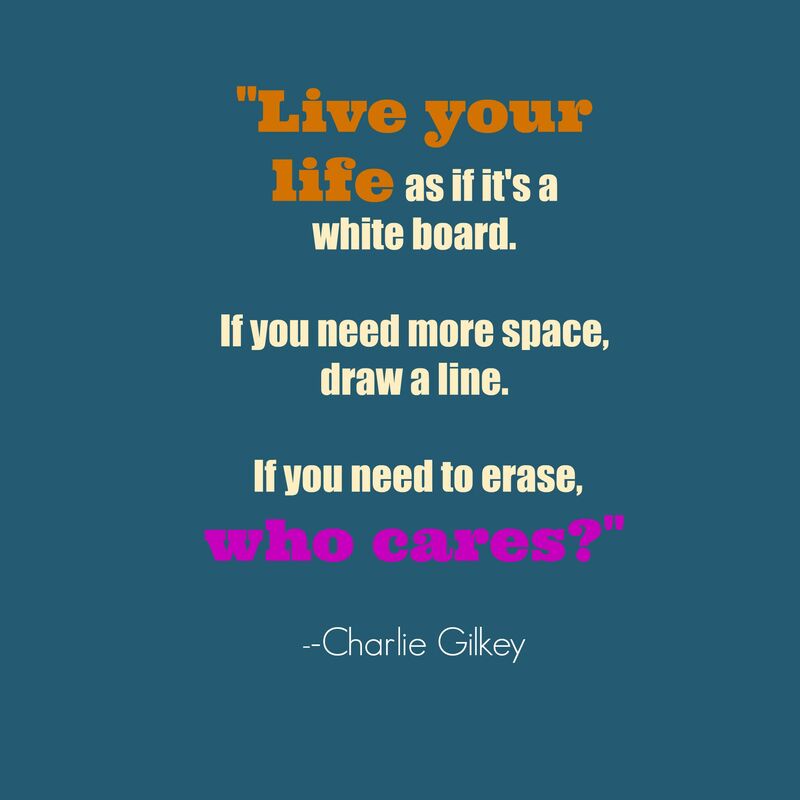 I’ll leave you with this quote from a productivity workshop led by Charlie Gilkey. You, too, can benefit from his wisdom by checking out his podcast, The Creative Giant Show. So, what about you? Are you feeling any butterflies? What kick-starts are you seeking? Feel free to share in the comments! wow – you are an inspiration in just having the courage to attend! I think you’ll achieve all you set out to do because you have that “can do” spirit that so many of us envy! You go girl!! I enjoyed your post and the camp sounds wonderful. Yes I feel butterflies. I’m nearing a new phase in life and there are so many unknowns. Do I stay in the house I’ve lived in since 1973? Do I retire? Do I move to a spiritual community? If so will it be in India or in Washington. The future is unknown. Karuna, your response intrigues me on so many levels. What exciting choices you have in front of you! It seems as if you have some adventures ahead, spiritually, geographically, and in work! 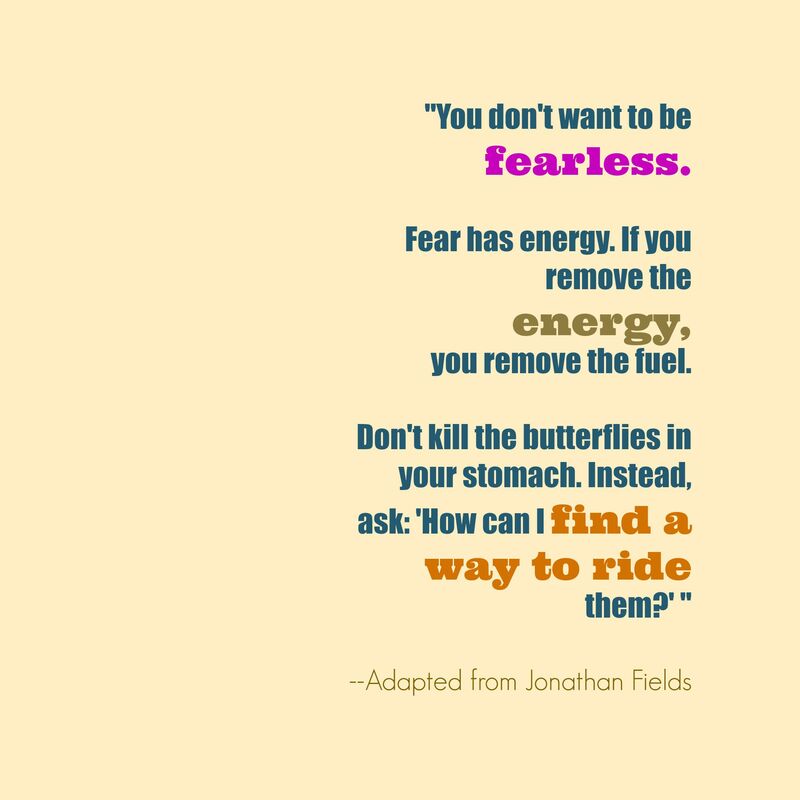 Wow, I wish you all the insight and optimism it takes to ride your own set of butterflies. . . Yes, my life has been full of adventure and I know there are many more in store. I’m so glad we have a chance to share those adventures on our blogs! Oooh, I want to do this! Thanks for letting us know. Linda, I highly, highly recommend Camp GLP–the spirit of the people there is genuine and inspriring–or whatever your own personal version of this experience may be! From what I know of your kind, resilient spirit you have a lot to offer this world where we get lost in the bustle of work, worries and woe! It’s out there! An entrepreneurial spirit can rejuvenate us back to thinking of that white board we are offered every day out feet hit the floor… Cheering for you! Marlene, how wonderful to see you here. When I get stuck in my thoughts, I’ll think of you and the concept of the white board. Yeah!! I am excited to see where this artistic spirit takes you. For remember wherever it takes you… It will be awesome. But one foot in front of the other and embrace it! I too jumped and I fell on my feet. I followed a man to Arizona and I have not looked back. I do get anxious about missing my family. BUT they are only a phone call away and an airplane ride away! True Happiness is amazing! Thanks, Nancy. It’s wonderful to hear about your happy new trails. Onward to new adventure!